Is Hallmark Homecare Right for Me? For families and seniors who want or need a more affordable alternative to in-home care, Hallmark provides just-in-time access to insured, background-checked, credentialed and experienced caregivers with verified professional references. Through Hallmark Homecare, you have access to the best caregivers available, thanks to our years of experience, our rigorous screening process, and our ability to tap a vast network of caregivers throughout the nation. Lower Cost. The Hallmark model of care cuts out the middleman (the agencies) and their overhead and profit margin, allowing us to pass the savings on to you. We can save you 35% – 50% or more compared to the alternatives. Our caregivers make a better living. By eliminating agency overhead, your ongoing savings allows you to pay your caregiver more than the traditional agencies pay them (on average, 30% more per hour) while YOU still enjoy the 35% or more savings on the cost of care. For you, this means a happier caregiver, better care, and improved caregiver continuity. You make the care decisions, with our professional guidance. Our experienced care coordinator consultation will explain your options and allow you to decide what’s best for you and your loved one – which means you’re in full control of what care is needed and your ideal schedule. We are always here to help. Our Care Coordinators work closely with you for your first 90 days with your caregiver, and beyond that you have unlimited access to our Care Coordinator Hotline for any additional help you might need. We only place experienced and credentialed caregivers. We at Hallmark require that caregivers be licensed and in good standing as CNAs, PCAs, LVNs, LPNs, CCAs or equivalent qualifications. We help protect you. With the Hallmark model, you always get a fully-insured caregiver; we also guide you through the process of arranging appropriate worker’s compensation insurance, automated payroll and tax processing services to ensure household employment compliance. We recognize that consistency of care is important to you. When we place a caregiver with you that you really like, the duration and scope of services that the caregiver provides is entirely up to you, not an agency that you may have engaged that can re-assign your caregiver to other clients. Your caregiver works for you, under your control, and will be with you for as long as you desire. It’s your call. We Guarantee Satisfaction. If within the first 90 days of service, your caregiver decides to quit or you decide to replace her for whatever reason, we will replace your caregiver for no additional fee. Hallmark Homecare supports and respects our Clients’ right to choice, control and affordability. Have questions? Read answers in our Frequently Asked Questions. Sound like what you’re looking for? Then please contact us online or give us a call at 1-888-519-2500 to see if we can help you! 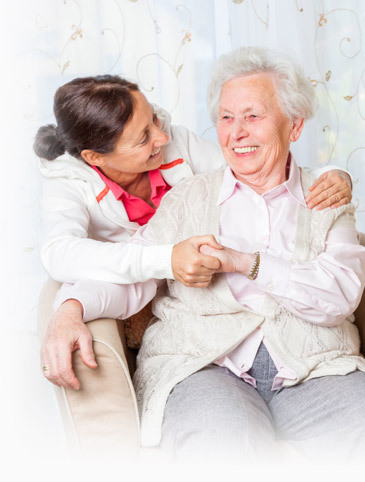 To begin the process of finding your perfect caregiver, simply contact us. Membership with NAPGCM underscores our belief that all seniors deserve safe, quality care. We proudly serve our Veterans and survivors with the VA Aid & Attendance program. TSC membership provides us with valuable resources and constant attention to best practices.